Deprived? No our children were not without! Although they did not have everything they wanted either. They had small allowances that gave them a few extras, but that seemed not to be enough. One day as they all sat around our kitchen table with their friends; four young girls laughing and remembering how they used to come up with extra money. My youngest was the most creative. They all laughed as they told on her. She would enter the local transit bus that she rode to school, and then pretend that she had dropped something. Has anyone found my quarter? She kept repeating the question until some kind person would fish a quarter out of their pocket or purse and hand it to her. Most of what they did, I am happy to say that I did not know about it at the time, but only learned about it later. My daughter is grown now, but she is still creative and has progressed to E-bay and is doing pretty well at buying and selling to make a profit. She also uses coupons and rebates - - not because she is deprived, but because she is able to share with homeless centers, schools and other worthy projects. I believe our quarters can be stretched and multiplied as we find direction. Have you found any quarters lately? Great post, Hazel. It is probably best that we don't know everything our kids are doing when they are doing it! LOL! I believe our quarters can be stretched and bless others. My husband and I truly believe God has blessed us and we need to bless others accordingly. OK, yes, kids are creative, aren't they?! Enterprising! I often say that the good things we do in the name of Christ are like tossing a pebble into a pond. They cause ripples that we may never realize. 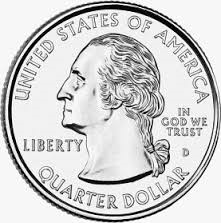 Find *quarters* and give *quarters* - it's what we're called to as disciples!